Several parts of Drishyam work but the film is more tackiness than craft, says Raja Sen. Some movies appear on our viewing doorstep carrying far too much baggage. Drishyam, for instance, is a Hindi remake of a Malayalam film of the same name made into several languages with leading men of exceptional pedigree, and which has also, I believe, stolen its set-up from a Japanese mystery thriller, The Devotion Of Suspect X.
That’s an awful lot of suitcases all right. As with too-eager houseguests, there are ways for filmgoers (and critics) to deal with such visitors, and in this particular case I decided against homework, invited the film in and asked it to leave its luggage out by the door. It’s a depressingly ordinary film, and the allegedly stolen plot -- about a crime being covered-up -- is something we’ve seen many, many times before. 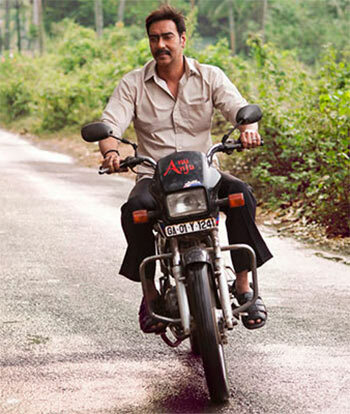 Ordinariness aside, Nishikant Kamat’s Drishyam is watchable and even builds tension effectively from time to time. But it ends up an overlong, overbaked drudge, largely because of Ajay Devgn in the lead, trying to look cerebral and calm while assuming solid-coloured shirts will absolve him of the artlessness he has flaunted in recent movies. It would be unfair to compare most leading men to masters Mohanlal and Kamal Haasan, but Devgn -- who used to be a striking brooder, a man who appeared to know how to simmer on the inside -- is now just talking softly while essentially swaggering along regardless. The way the film sees him doesn’t help. Even while playing an everyman who loves his family, a song montage in Drishyam has Devgn standing away from his wife and daughters, wearing sunglasses and striking a hero pose till the family comes and coos over him. Something must be done to save his world, and Vijay -- a film-lovin’ orphan who prefers spending most nights with a tiny TV in his office instead of his moronically indulgent wife -- takes inspiration from the movies. Except, and here is one fundamental problem with this meta film-within-film setup, he doesn’t really do or learn anything of actual brilliance, with films having apparently taught him the mere value of being stubborn. There are times he gets a lump in his throat watching Bachchan ham it up hard or one in his trousers watching Sunny Leone do the same, but it all appears too forced. Save for a couple of scenes, the cinema-beats-life trope doesn’t really pay off. What does pay off, as always, is casting Tabu in a meaty role. Despite first showing up in a bewilderingly tight police shirt -- which then leads to her striding through a corridor in slow-motion, almost a la Baywatch -- the actress is characteristically impressive in her role of a no-nonsense cop. There’s a case, she has a stake in it, and she knows what she’s doing -- something Tabu expresses with brilliant weariness as she rolls her eyes at her husband who objects to her brutal methods. The narrative intent is clear -- to normalise the world (and Devgn) before shifting into thriller-mode -- but the film is clumsily written, with dialogue that sounds wooden; the first hour of the film sounds like an amateurishly dubbed film instead of one we’re watching natively. But mostly there is more tackiness than craft, demonstrated best by the ill-produced recreations of the movies Vijay watches and in the way fake newspapers are visibly made up of computer printouts with Times New Roman taken too literally. Don’t get me wrong, several parts of the film work and, for the most part, Drishyam motors along far more efficiently than most Hindi films -- but isn’t that too low a bar?